Thank you so much for your help this past month. On October 19th, general manager Tom Busch will accept our Gabriel “Radio Station of the Year” award at Universal City, California. We are delighted that a few of you will be able to join us for that celebration. Regardless of whether you will be physically present, all of us will be thinking of you that night, and thanking God for your kindness to our mission. May Our Lord bless you greatly! IT’S GOSPEL: (left) Pastor for the churches at both Nome and Kotzebue (KAHT-zeh-byoo, 180 miles northeast of Nome), Fr. 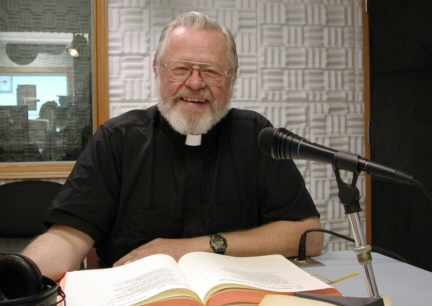 John Hinsvark takes time to record Sunday Gospel readings in KNOM Studio C.
Lynette Schmidt is producing the full 3-year cycle of Gospel readings. Each airs during the week before its scheduled Sunday. ONE MILLIONTH SPOT: 31 years of KNOM program logs, the daily guides for announcers, would form a stack more than 50 feet high! Over the years, we have continuously recycled that paper. And so, we do not have an exact count of how many spots we have aired since KNOM first signed on in July 1971. Its first three years, KNOM operated only 16 hours a day, stretching to 18 hours in 1974. A few summers it extended hours to 20 and to 24, and we began round-the-clock broadcasts in January 1997. Because of both disasters and major improvements, we have been off the air a total of about ten days. So an approximate count of spots involves many factors. Based upon our best calculation, we believe that sometime in October 2002, KNOM will broadcast our 1,000,000th inspirational spot! Please remember missions like KNOM in your will. All bequests are prayerfully applied toward future major improvements and savings for unforeseen emergencies. INSPIRATIONAL SPOT: The disciples had very narrow goals for Christ. They wanted him to deliver a certain kind of people at a certain time from the hands of their oppressors. Jesus had wider goals. He dreamed of delivering all mankind for all time from the oppression they suffer at their own hands and from the fear and guilt and the lack of love that makes their lives small, pinched and un-free. How do I perceive life? Like the disciples, are my expectations too small for the Mind of Christ? INSPIRATIONAL SPOT: If you’ve ever built castles in the air, your work need not be lost. That’s where they should be. Now, put the foundations under them. To dream dreams is to stretch the mind and draw the blueprints for future accomplishments. top WELCOME to incoming KNOM volunteer news reporter Julia Dunlap (left), who hails from Lakeview, NC. She’s a 2002 graduate of Meredith College, majoring in religion and psychology. “I’m excited to meet the many interesting people here,” Julia says. In her spare time, Julia likes hiking, singing and dancing, and she’s a voracious reader. What does she read? “If it’s got words,” she laughs. WEATHER-WISE: In mid-October, Nome’s temperature can drop to zero, or hover around +10° for a week, or it can rise to +55°. It can rain like crazy, or it can snow nearly a foot. One October (1946), fifty-foot Bering Sea waves crashed over buildings on Front Street, a stone’s throw from where KNOM now stands. Fortunately, such storms occur only rarely! Thanks to your support, both KNOM’s studio and transmitter facilities have reliable backup electric generators that will keep us on the air during weather emergencies. ABOUT KNOM: We are the oldest Catholic radio station in the United States, founded in July 1971. Owned by the Catholic Diocese of Fairbanks, we beam a powerful signal 24 hours a day to extremely remote villages throughout 100,000 square miles of western Alaska. The KNOM approach is to become a friend to the listener on a personal, caring, positive level, within a consistent radio format. Our staff includes five full-time and five part-time professional broadcasters, plus three full-time volunteers. Our only source of income is the kindness of good people like you. Thank you! INSPIRATIONAL SPOT: Teach me to listen, Lord, to those nearest me: my family, my friends and my coworkers. Lord, teach me to listen to those far from me, the forgotten, the anguished. Teach me always to listen. INSPIRATIONAL SPOT: Stopping can be incredibly important. Stopping, and becoming aware of the beauty of God’s handiwork in nature all around me. Stopping and figuring out where I came from and where I’m going. Stopping and counting the people who love me and how I treat them. Yes, stopping can make a big difference in my life. top CAPITAL IDEAS: (left) U.S. 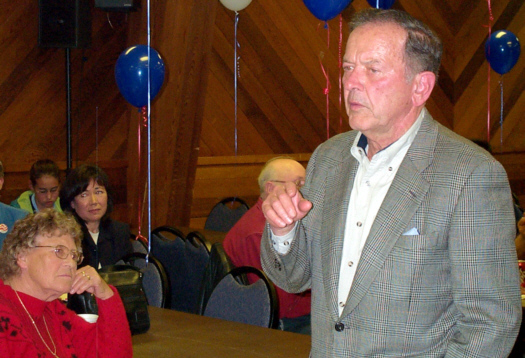 Senator Ted Stevens talks with Nome residents during a brief visit recently. In an interview over KNOM, the senator discussed the many problems that will face rural Alaska in coming years. THIRTY YEARS AGO: October 1972 saw great excitement on Little Diomede (pronounced DYE-uh-meed) Island, when villagers spotted a Russian Eskimo umiak (pronounced OO-mee-ack, a wood-frame boat with walrus skin hull) at the International Date Line. Little Diomede is an Alaska village of about 150 souls, about 2.5 miles from its counterpart island on the Russian side. Villagers gathered chewing gum and candy and chased after the Russian Eskimos, caught up with them and spent fifty minutes trading and exchanging family information. Also that month, former KNOM volunteer John Pfeifer, then working for station WAKE in Wichita, met country singer Charlie Pride, who recorded greetings for airing over KNOM. 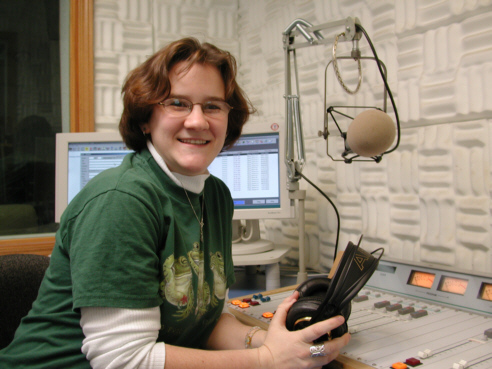 SPOT CHECK: As we approach the one million mark, so far during 2002, KNOM has broadcast approximately 28,300 inspirational spots, and an equal number of educational ones, thanks to you. INSPIRATIONAL SPOT: A little kindness to one person is better than a vast love for all of mankind. 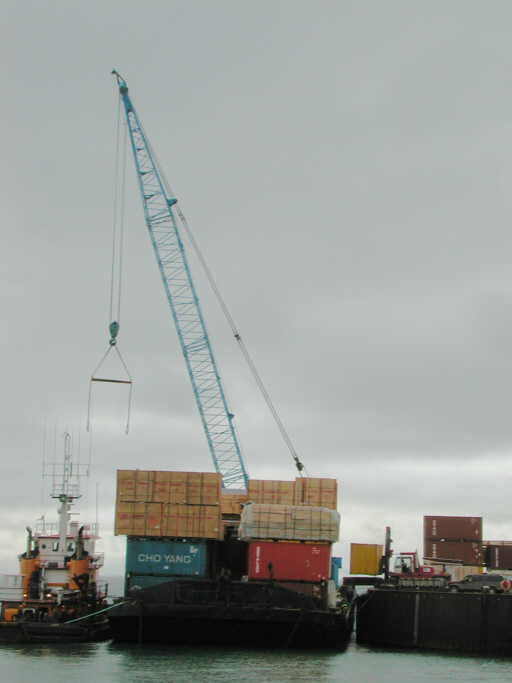 top FORK IT OVER: (left) On a gray autumn afternoon, a giant forklift (at bottom right) unloads a container van from Northland Service’s oceangoing barge #230, pulled by the tug Polar Breeze. Each year, a half-dozen such barges carry lumber, cars and trucks, canned goods and other freight from Seattle. A REAL ICEBREAKER: In other nautical news, thirty-eight scientists passed through Nome recently, at the end of a forty-day voyage on the Arctic Ocean to study global climate change. They were on board the U.S. Coast Guard cutter Healy, working on a dozen research projects studying ocean salinity, minerals, light transmission and plant life. Researchers say that the ten-year program is the most ambitious study of global climate change ever undertaken. Anchored offshore Nome, the Healy was an impressive sight. It’s the Coast Guard’s only 420-foot icebreaker. Last year, it was the second surface ship in history to reach the North Pole. “SCALED” DOWN: Salmon fishing was a disaster again this year. The numbers of returning fish were so low in most rivers and streams that fishing was closed for most of the summer. In a couple of spots, however, there were brief, slightly larger runs, and some families enjoyed drying and smoking salmon for winter use, for the first time in several years. Again, thank you for your prayers and for your financial help. You are the backbone of our mission to thousands of isolated families throughout 100,000 square miles of wilderness Alaska. May God be with you! INSPIRATIONAL SPOT: In our final accounting to God, He’ll surely ask how well we did all of the things we had to do. He’ll also ask about all of the good things we could have done.